As much as James and I enjoy exploring the city, checking out Toronto's hottest restaurants or going to a show/movie, we are complete homebodies at heart. Our idea of the perfect fun night out is being curled up at home or going for casual strolls around our neighbourhood (woo, the Junction!) with our cute furry friend. Lately we've both been traveling quite a bit, sometimes with conflicting schedules. Being at home and coming up with quick, in-the-moment "date night" ideas has become our thing! Here are some ways we've been spending quality time together, while being relaxed, stress-free and comfortable. With warm weather just around the corner, we're stoked about the idea of going to High Park to spend an afternoon. We often stop by Lunch Box for brunch and smoothies, then walk for HOURS through the park; there is always something to see or do! It's great that we can bring Frenzi along so he doesn't stay cooped up in the condo. This is definitely a fun, cheap way to hang out together and enjoy nature! A little friendly competition never hurts, right? Actually you should see James' reaction when he's losing... it's hilarious. We love playing games together! I recently found a whole bunch of cool games on Uncommon Goods, an online platform where artisans can pitch and sell their products to the public. The idea is that you can't typically find these items elsewhere, hence the name. They ship to various countries as well; be sure to go through the FAQs before you order. We ordered One Up! The Wicked/Smart Word Game (photographed above); it's similar to Scrabble but you have to put words together from a pile of letters. Since I always get side-tracked when shopping online, I noticed how amazing the gift ideas were too, and now I've got something planned for James' next birthday... which isn't for another 8 months. 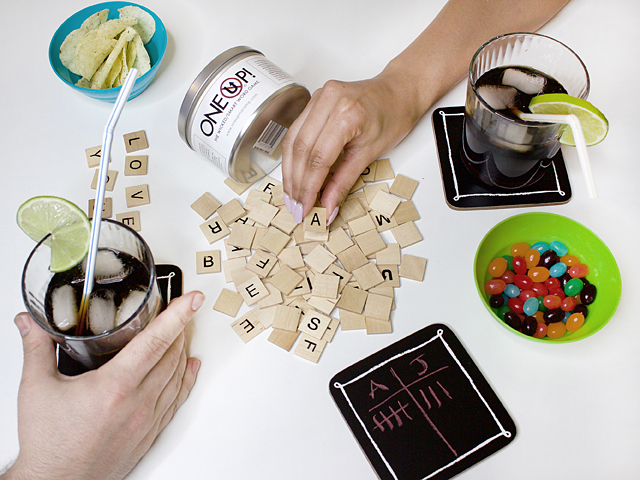 The blackboard coasters in the photo are also from this website; they've got a lot of unique home decor items as well. Until recently I had a crazy fear of cooking. It was difficult for me to come up with meal ideas and what sort of ingredients I might need to make it happen. I've always loved baking, probably because of the precision, so I began doing the same with cookbooks and now I'm having SO much fun with it. I even joined a cookbook club! Go grocery shopping and get in the kitchen together to help make an AMAZING romantic dinner for two. James is already an excellent cook (#HubbyShouldveBeenAChef) and has been guiding me as I learn and get better. Divvy up the tasks, chat or listen to music while you cook, and you'll be done and ready to eat in NO time. Now that you're done eating dinner, have cleaned up... why not complete the date night on a sweet note and go out for dessert? Our FAVOURITE place to grab a treat is Sugar Marmalade; if you follow me on Instagram or Snapchat you are probably sick of watching me go there all the time... I blame Golden Treasures Mixed for the weight I've gained last couple of years. We've been known to skip out on dinner completely and go for dessert. If you're still feeling lazy and full, there is a reason why delivery apps exist (hello UberEATS). What is your idea of a fun, easy date night? I'd love to add more to our list. Join the conversation on Twitter and Instagram! This post was kindly sponsored by Uncommon Goods.